Metcard weekly and monthly tickets won’t be available for sale from this Sunday (though you’ll still be able to use them if you have them). Myki’s equivalent to Weekly, Monthly and Yearly Metcard tickets is Myki pass, which gives unlimited travel on the days paid for. 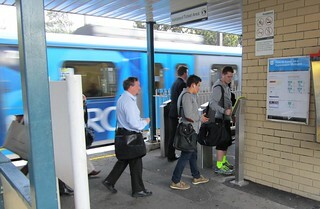 The pricing of a Metcard Weekly is identical to a Myki 7-day Pass. The pricing for a Monthly or Yearly Metcard is almost identical to a Myki 30-day or 365-day Pass — but with Myki you can choose the number of days, anything from 28 to 365 days, to work around holidays, long weekends and so on. It averages out to about the same amount of money (though since this is a leap year, once could argue there’s no direct equivalent to a Metcard leap-yearly/366 day pass). (Don’t buy a Yearly/365-day Pass at the retail price. Get it via Commuter Club from your workplace, if offered, or via the PTUA). There is one significant difference with Myki: if you have a single zone (1 or 2, not both) Pass, you don’t get the bonus weekend travel in the other zone that you did with Metcard. You do get a discount though, of the price of a 2-hour fare in the zone you paid for, and the price is capped at the $3.30 weekend rate. The net result is a Zone 1 Passholder travelling into zone 2 on a weekend pays an extra 2 cents. It’s more for a Zone 2 Passholder going into zone 1, or a Concession fare. On the up side, the weekend discount applies on public holidays as well as Saturday and Sunday. Oh, and the big plus to using a Myki Pass is that in most cases you don’t need to bother touching-off… but that’s the subject of a future post. Remember the other good thing about myki pass is you can pay for it with your myki money balance (though apparently only at a myki vending machine… this can’t be done at a retailer). So in the course of a month you can get rid of change and small notes to build up your myki money balance to at least the cost of the pass you intend to buy, and then when you buy the pass a “pay with myki money” button appears at the final stage. It’s one of the best things about myki and not many people are aware of it. Why, oh why, oh why don’t they just run it so that you fill it up with money, then start travelling, and if you end up doing more than a certain number of days in a calendar month then they rebate some money to discount those days appropriately, and then do the same thing annually if you end up using more than a certain number of days per year? That is the point of having an electronic card system connected to a stash of money. Why won’t they do it? Why cling to something like the weekly-monthly-yearly system they were forced to use when tickets were physical things? And why make those separate from the setup for just using pay-as-you-go money? As a non Melbournite I just read this post and thought, too bloody complicated. I’ll just take my car. @Philip, agreed. That’s how it works in the ACT (although not on a rolling basis, just calendar month. The same issue with poor-performance refunds – why do I need to send a form in when even a basic scan of the travel history would indicate whether a user was entitled to compensation, which could be then applied automatically without user intervention (read: bother). @Philip. I agree wholeheartedly. “Myki always chooses the lowest price” my arse. @Dave. Precisely because bugger all people go through the process to get the refund. Early on there were proposals to use a Weekly cap instead of a prepaid Weekly fare. The problem was they couldn’t figure out how to do anything other than have the cap be a Monday to Sunday cap. This means in some cases people would have ended up paying more (eg for Wednesday to Tuesday), so they canned the idea. Ideally they could have done a rolling week, but apparently it was too hard. In retrospect, perhaps they should have pushed ahead with the plan, knowing it would benefit far more than it would disadvantage. I understand the claiming (via form) logic, I just think it’s inexcusable. Just a thought. If 2.5 million people get a MYKI card (some will only have it for emergency use) and they top it up with $10, then MYKI will have $25million to put on the overnight money market which at current RBA rates will generate just short of $300,000 per day!! Now where is that going? @PJ, with those calculautions, Greek Bonds possibly? Um no, closer to 3,000 a day.